an open space, where people are welcomed and assisted regardless of their origins, race, gender and class. It is a place that is open to the city, where civil society actors can enter and monitor the situation. a disobedient space, where voices are heard that denounce racist agitation, any attempt to block arrivals, and any policy of deterrence. a space where human rights are respected, where people are not exposed to the risk of torture, persecution, or inhuman and degrading treatments. a space where the right to mobility is enacted, where people are granted the possibility to stay but also to move on. a place where neither migrants nor those who stand in solidarity with them are criminalised – neither for driving the boat on which they travelled, nor for rescuing people in distress at sea, neither for giving migrants independent information, nor for helping them to continue their journey. After our initial meeting in Palermo, we took part at a conference in Naples on the 19th of July, following an invitation by its mayor Luigi De Magistris. During this gathering, further steps in generating transnational cooperation and political interventions were taken. Through this new initiative, we want to turn our cities into spaces of inclusion, not exclusion, of refuge and sanctuary, not deterrence. We struggle for communities of welcome and against those of segregation. We want to foster intra-municipal and trans-border solidarity that allows people to move freely from their first place of disembarkation to other destinations within and beyond the country where they first landed, beyond any hotspot and Dublin system, through a form of ‘relocation from below’. The conflict over Mediterranean migration has further escalated over the past six weeks. The closure of Italian harbours to the rescued at sea, the criminalisation of non-governmental rescuers, and the support granted to Libyan authorities by European institutions and member states has further deteriorated the situation for those seeking to cross the Mediterranean from Libya. The result has been devastating. In the month of June alone, about 564 people are acknowledged as having died in the Central Mediterranean, although only 3,100 people reached Europe via this route from Libya. Last year, in June 2017, the figure of arrivals stood at 23,500. That the situation has further worsened is not due to fate but due to a calculated letting-die policy enacted by European nation-states and institutions. A significant dimension of such policy is the criminalisation and the pushing out of non-governmental rescuers and witnesses, which in particular the Italian government, but also the ones in Germany and Austria have forcefully pursued. Through the absurd stand-off with the Aquarius vessel carrying more than 600 precarious travellers in mid-June, the Italian government not merely endangered their lives and well-being, but acted on its cynical promise to prevent disembarkations in Italy, no matter the costs. And the costs are great. During the six week period covered in this report, the Alarm Phone was involved in 176 Cases in the Western Mediterranean Sea alone. According to UNHCR data released on 23rd of July, 23,993 people have crossed into Spain in 2018 so far, among them 3.158 travellers who crossed the land borders to the Spanish colonies Ceuta and Melilla.15 The figure of 20.835 successful sea crossings is very impressive, especially considering that most of the boats crossing the Strait of Gibraltar are rubber boats, carrying only a small number of people, mostly between 4 to 12 travellers per boat who have to paddle as in most cases they do not have an engine. The figure would be even more impressive if the high number of interceptions and crossing attempts was taken into consideration. There are no official statistics on interceptions conducted by the Moroccan Navy, the Marine Royale, or on interceptions conducted by the Moroccan military, the ‘Forces Auxiliaires’, in the woods where people are (often violently) arrested already in the attempt to reach the water. Of the 176 Alarm Phone cases in the Western Med during the period covered in this report, 71 boats were rescued by the Spanish rescue authority and 79 boats picked up (mostly intercepted, in some cases rescued out of severe distress) by the Moroccan Marine Royale. Thus, nearly 45 percent of attempts to cross were successful.16 This means that the level of engagement of the Moroccan authorities is a crucial factor in how many attempted crossings end with a boza, with the arrival in Spain. Morocco is a key partner for the EU in its externalization of migration control. As many travellers are trapped in Libya due to the recent EU attempts to block the Central Mediterranean route, numbers of crossings in the Western Mediterranean continue to rise17. The EU border agency Frontex warns that the next ‘migration corridor’ would be from Morocco to Spain. Frontex chief Fabrice Leggeri announced that 6.000 travellers had successfully crossed into Spain via Morocco in June 2018 alone, the UNHCR counts even 7.313 crossings. Leggeri called Spain his ‘greatest worry’.18 Obviously, he is not worried about the people who have no safe escape routes anymore and who have to risk their lives at sea.19 The political consequences in terms of border policing in light of the increased crossings in Western Mediterranean remain to be seen. What is already clear is that routes are shifting further south and become hence even more dangerous. Boats started to cross again from Mauritania to the Canaries,20 with 434 arrivals counted by UNHCR so far this year.21 Even further south, boats start to leave from Senegal towards the Spanish islands: On 16th of June, the Mauritanian Coast Guard intercepted boat with 125 Senegalese travellers.22 The Western Mediterranean, as does the whole Mediterranean Sea, remains a lethal border zone23. As was the case in our previous reports, also in this six week period, the Alarm Phone accompanied people who eventually lost their lives at sea. In these cases, and where possible, we tried to stay in contact with their relatives and friends. While favourable weather conditions play a part in the upsurge in people leaving for Spain, Morocco proves time and again why staying there simply is not an option for many Sub-Saharan migrants. Arrests and removals towards the south of the country continue in the border regions, but we have also witnessed attempts far away from the borders that attempt to make the lives of Sub-Saharan migrants as difficult as possible. In the evening of the 7th of July, the Moroccan authorities began evicting the camp next to the train station in Fes, which was home to more than 1,700 people. For eight years, the self-organised camp has been a place where people could rest and recover after being deported from the border areas. During the eviction, the police burned tents and personal belongings, stole phones and money, and hundreds of people were deported to Marrakech, Beni-Mellal, Agadir and Essaouira in more than ten busses. The new Spanish government has promised to improve the situation at Spain’s southern borders. Amongst others, the Spanish president Pedro Sanchez announced that he would work toward taking down the barbed wire covering the fences between Morocco and Ceuta and Melilla.32 On 28th of June, the Spanish interior minister Fernando Grande-Marlaska visited his counterpart Abdelouafi Latfit in Rabat in order to discuss – among others – the illegalized migration movements from Morocco to Spain33. The ministers announced that the concertina barbed wire will only be removed if the ‘security’ at the common border can be assured alternatively. The idea of detention centers in countries of origin and transit has been widely discussed in the last weeks within the EU, but this idea was rejected by the Moroccan foreign minister Naser Burita, who announced after the meeting with the Grande-Marlaska that Morocco ‘rejects and will always reject’ those kind of centers as they appear to be an ‘easy solution’ for the EU, externalizing the ‘problem’ but not addressing it.34 Further developments regarding facilities on Moroccan soil remain to be seen. Alarm Phone activists from Oujda as well as other Algerian and Moroccan activists called for a joint march on 22nd of July towards the common border of the two countries, starting from Oujda (Morocco) and at the same time from Maghnia (Algeria). The activists demand to re-open the border that has been closed since 1994.37 They demand freedom of movement and oppose the border externalisation strategies of the EU. This very border crossing between Maghnia and Oujda is one of the most dangerous entries to Morocco for travellers as it is highly secured and consists of deep trenches and a high fence. An open border in this region would be crucial for the travellers to reach Morocco safely and for the struggle for freedom of movement. Every two weeks activists will march now towards the border from Oujda, Morocco, with the next march scheduled for the 5th of August. While the numbers of sea crossings have dramatically increased in the Western Mediterranean Sea, they remain rather low but consistent in the Aegean Sea. 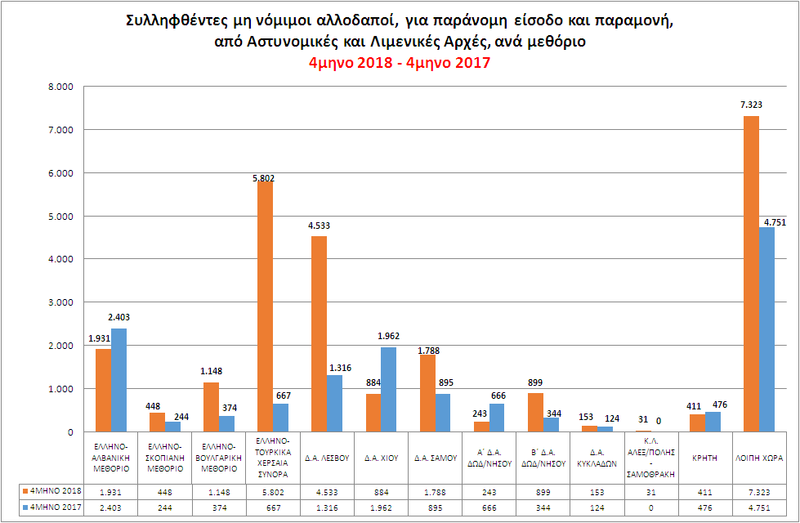 2,439 people reached the Greek islands in June. Although it is not yet clear where they had departed from, a boat carrying about 150 people capsized between Turkey and Cyprus in mid-July. 19 people have been found dead, 30 people went missing, about 100 survived. In order to cross this land border, they have to overcome the Evros river, which is a dangerous endeavour, and have to pass unnoticed by Greek and Turkish border police. Unfortunately, many are caught on the Greek side and illegally transferred back to Turkey. These so-called push-back operations are for several years now frequent practices and constitute systematic violations of human rights of the precarious travellers as their right to access safe territory and seek protection is denied. As outlined in the next paragraphs, over the past six weeks, the Alarm Phone has documented and denounced four such push-back operations. A fifth group was pushed-back in the night from 21st to 22nd of July and we are still conducting a follow-up for this group, as some members of them are still detained in Turkey, held in miserable conditions. Allegedly, some were able to escape but at least one person of the arrested was reportedly returned to Syria. Among the group were two children, two women, and two sick persons. The first case occurred on Saturday the 30th of June 2018. In the early morning, we had been informed about a group of people along the Turkish-Greek land border that was in need of support. Five of them were from Syria, five from Sierra Leone, six men, two women, and two children. We contacted the travellers, received their GPS position, and notified the police to their whereabouts, as the travellers had asked us to do. The police confirmed to us that they would search for them. Hours later, in the early afternoon, one of the members of the group told us that she was on her way back to Istanbul. She informed us about what had happened to them: At around 9am local time, they had been found by Greek officers in blue & black uniforms. Their belongings was taken away, and at least 5 of them were forced back to Turkey. They had not taken any pictures as their phones had been taken away. Our contact person had been able to hide her phone. They were kept in confinement for about one hour and treated badly, “like dogs” she said, before being forced onto a boat that returned them illegally to Turkey. On Thursday the 5th of July, the second push-back operation was observed by the Alarm Phone. We had received a distress call from a group of Syrian, Iraqi, Yemeni and Sudanese migrants who had crossed into Greece seeking international protection. The group was found by the Greek police. The police handed the group to Greek officers who did not hesitate to use violence and intimidation. They were beaten, robbed, and forced onto a boat that returned them to Turkish territory. In the night of 5th-6th of July 2018, a group of 12 people from Syria and Iraq, including two women, one of whom was elderly, two children (six and eleven years old), and eight men, was reportedly apprehended on Greek soil near Mikrochori in Evros region and pushed back to Turkey. It remains unclear what happened to them upon return to Turkey. In the night of 9th-10th of July 2018, 19 people from Syria and Iraq, including a one-year-old child, a pregnant woman and a man with a broken leg, were reportedly pushed-back from Greece to Turkey at the land border in Evros. They arrived on 9th July and had sent a SOS-call to the Alarm Phone. The first GPS coordinates received showed their position near Filakto. The group said they had sick kids with them and they were very hungry. A second set of GPS coordinates sent showed them at a position near Provatonas. Communications with the group broke down in the afternoon and only in the late morning of the next day, the group answered again – now from Turkey. They reported that ‘the police’ had found them around 5pm on the 9th of July. They brought them to a place the migrants described as ‘a prison’. At 10pm, the officers allegedly wearing blue trousers and camouflage sweaters, told the group that they would be moved to a camp so that they could apply for international protection. However, instead, they brought them back to the river. There, according to one testimony, the men of the group were beaten. Their belongings such as phones, money, passports and the food for the infant were taken away. They were then put onto a boat at the river and were threatened not to come back to Greece again. Reacting to our questions concerning cases 3 and 4, the Greek police stated that they had not found anyone at the positions we had provided them with. On Saturday, July 21, at 19.28 CET, The Alarm Phone received a message from a contact person indicating that 27 people had been missing for 3 days near the Greek/Turkish land border, having been left there without food and water. The shift team immediately contacted the relevant actors in the region, including the UNHCR, and learned that the Greek Border Police was reportedly already looking for the group. The following day, the shift team received information that some members of the group had been pushed back to Turkey and that their shoes and other belongings had been taken away or destroyed by the Greek authorities. The shift team maintained contact with a contact person as well as relevant NGOs and International Organisations. The contact person alerted our shift team at 16.50 on July 22 that 12 travelers were in a Turkish detention centre, including her brother and sister. On July 23, we were able to speak to one person from the returned and can confirm that they have been pushed back to Turkey. The Alarm Phone was not able to gain information about all travellers in the group, as several have disappeared after the Turkish authorities appeared and started arresting them. Allegedly, some could escape but at least one person of the arrested was reportedly returned to Syria. A follow-up is still ongoing. In the past 6 weeks, the WatchTheMed Alarm Phone was engaged in 187 distress cases, of which 176 took place in the Western Mediterranean, 7 in the Aegean Sea, and 4 in the Central Mediterranean. You can find links to the individual reports below. On Wednesday the 11th of July, the Alarm Phone shift team was alerted to 2 boats in distress in the strait of Gibraltar. Both of them were returned to Morocco by the Moroccan navy (see: http://www.watchthemed.net/index.php/reports/view/949). On Thursday the 12th of July, the Alarm Phone shift team was alerted to five boats on their way towards Spain. Four of the boats were rescued by the Spanish search and rescue organisation Salvamento Maritimo (SM) and one was intercepted by the Moroccan navy (see: http://www.watchthemed.net/index.php/reports/view/950). On Wednesday the 13th of June, the Alarm Phone shift team was alerted to two boats in distress in the strait of Gibraltar. The first boat was rescued by the Moroccan navy. From the second boat four survivors were rescued to Spain, whilst 44 travellers remain missing (see: http://www.watchthemed.net/index.php/reports/view/916). On Thursday the 14th of June, we were alerted to three boats in distress in the strait of Gibraltar. Two groups were rescued by the Moroccan navy, but from the first boat two people who had fallen into the water remain missing. The third boat was rescued by a Spanish vessel and brought to Spain (see: http://www.watchthemed.net/index.php/reports/view/917). On Friday the 15th of June, the Alarm Phone shift team was alerted to 14 boats in distress in the strait of Gibraltar, of which 11 were rescued by the Spanish search and rescue organisation Salvamento Maritimo (SM), and three by the Moroccan navy (see: http://www.watchthemed.net/index.php/reports/view/918). On Saturday the 16th of June, the Alarm Phone shift team was alerted to two boats in distress in the Western Mediterranean. Both boats were rescued by the Moroccan navy. However, one traveller drowned during the rescue operation of the second boat (see: http://www.watchthemed.net/index.php/reports/view/923). On Monday the 25th of June 2018, our Alarm Phone shift teams worked on a total of 14 distress cases. 10 boats were rescued to Spain, 3 boats were intercepted, and the fate of 1 boat remains unknown (see: http://watchthemed.net/index.php/reports/view/924). On Tuesday, the 26th of June 2018, the Alarm Phone worked on 10 emergency situations in the Western Mediterranean Sea. 5 boats were rescued to Spain while the other 5 were returned to Spain (see: http://watchthemed.net/index.php/reports/view/925). On Wednesday the 27th of June 2018, the Alarm Phone was alerted to two emergency situations in the Western Mediterranean Sea. Both were intercepted by the Moroccan Navy and returned to Morocco (see: http://watchthemed.net/index.php/reports/view/926). On Thursday, the 28th of June 2018, our Alarm Phone dealt with five emergency situations in the Western Mediterranean Sea. Four boats were intercepted/rescued and returned to Morocco, one was rescued to Spain (see: http://watchthemed.net/index.php/reports/view/929). On Friday the 29th of June 2018, our Alarm phone shift team was alerted to 4 boats in distress in the Western Mediterranean Sea. Two were rescued to Spain, two returned to Morocco (see: http://watchthemed.net/index.php/reports/view/930). On Tuesday, 3rd of July, Alarm Phone was in contact with two boats in distress from Morocco towards Spain. Both returned to Morocco by own forces. In one case, a young man died afterwards in the hospital (see: http://watchthemed.net/reports/view/936 ). On Thursday, 5th of July, we were alerted to a boat in distress in the Strait of Gibraltar, carrying 6 persons. The boat was in distress and in the evening the travellers had reached the Moroccan shore by themselves (see: http://watchthemed.net/reports/view/937). On Saturday, 7th of July, we were alerted to a boat in distress that had left from Cap Spartel, carrying 8 people. The boat couldn’t be found. The next day at 1:06pm a contact person confirmed that they had managed to return to Morocco safely (see: http://watchthemed.net/reports/view/939). On Monday the 9th of July, at 07.30am CEST, we were alerted by a contact person to a group of 9 travellers, including 1 baby, who had left from a beach south of Tangier. We called Salvamento Maritimo (SM) and informed them of the travellers. SM told us that they were aware of the boat, which they said was in Moroccan waters. We offered the GPS position of the boat. At 08:30 am the contact person informed us that the travellers were taken back to Morocco by the Moroccan navy (see: http://www.watchthemed.net/index.php/reports/view/947). On Tuesday the 10th of July, the Alarm Phone shift team was alerted to two boats in distress in the strait of Gibraltar. Both were intercepted by the Moroccan navy (see: http://www.watchthemed.net/index.php/reports/view/948). On Saturday the 14th of July, the Alarm Phone shift team was working on 11 distress cases in the strait of Gibraltar. Three of the boats were rescued to Spain and eight of them were returned to Morocco. Apart from the cases we were actively involved in, we were alerted to another seven cases, of which six were intercepted before we had time to intervene, and one was rescued to Spain (see: www.watchthemed.net/index.php/reports/view/951). On Sunday the 15th of July, the Alarm Phone shift team was alerted to four distress cases in the Strait of Gibraltar. One of the boats was rescued by the Spanish search and rescue organisation Salvamento Maritimo (SM). Two of them were returned to Morocco by the Moroccan navy. In one case we lost contact to the travellers, and the contact person was also not able to provide news about the case, thus it is uncertain whether these travellers were rescued by the Moroccan navy as well (see: http://www.watchthemed.net/index.php/reports/view/952). On Thursday, the 28th of June 2018, our Alarm Phone shift team was alerted to a group of travellers in distress at the Turkish-Greek land border. There were children and elderly people among the group of 9 people, 5 men, 3 women, and a child. They had been walking for three days and were exhausted. They had also run out of food. A police station informed us finally that the people had been arrested, but refused to relate further information to us (see: http://watchthemed.net/index.php/reports/view/933). On Monday, 2nd of July, we were alerted to a group of travellers in Evros river border zone, asking for assistance. They were 14 people, among them women and babies. The police in Alexandropolis confirmed the assistance of the 14 travellers finally (see full report here: http://watchthemed.net/index.php/reports/view/940). On Tuesday, 3rd of July, the Alarm Phone was alerted to two cases at the Turkish-Greek landborder: First a group of 10 travellers asked for assistance. They were stuck close to the Greek village of Peplos. They sent their GPS position. We called several authorities but couldn’t get any new information on the status of a police operation. Finally as we had lost the contact to the group, we decided to close the case. At around 9pm CEST we were alerted to a second group consisting of 11 people that were close to Praggi on the Greek side of Evros river. In the morning we reached them directly. They were in need of medical assistance, food and water. We called the police in Didimoteicho, the closest town. At 8:18pm the contact person informed us that the group had decided not to wait for assistance. We decided to close the case (see full report here: http://watchthemed.net/index.php/reports/view/941). On Thursday, 5th of July, The Alarm Phone assisted two groups of travellers in the Turkish-Greek border zone. One group of 14 travellers, among them 3 women and 2 children, was pushed back to Turkey. At 4pm CEST we were alerted to a second group of 12 people stuck in Evros river border zone near Mikrochori, Greece. We couldn’t establish anymore a connection to the travellers and couldn’t find out anything contacting the local authorities and UNHCR. It remained unconfirmed what happened to the group (see full report here: http://watchthemed.net/index.php/reports/view/942). On Sunday, 8th of July, at 11:14pm CEST, we were alerted to a group of travellers stuck near Tichero, Greece. After alerting the local police, the next day we were informed by a contact person that the group had been found and that they had been allegedly violently pushed-back to Turkey (see full report here: http://watchthemed.net/index.php/reports/view/943). On Saturday, July 21, at 19.28 CET, The Alarm Phone received a message from a contact person indicating that 27 people had been missing for 3 days near the Greek/Turkish landborder being left without food and water. After contacting the relevant actors in the region, including UNHCR, our shiftteam learned the following day, that parts of the group had been pushed back to Turkey. Allegedly, at least one person of the arrested got reportedly returned to Syria. Among the group were two kids, two women and two sick persons. (see full report here: http://www.watchthemed.net/reports/view/955). On Friday the 15th of June at 11.46am CEST, the Alarm Phone shift team was informed by a contact person about a group of 100-160 travellers who had left on a rubber boat at around 6pm local time from Zuwarah, Libya. The contact person forwarded us a position of the travellers along with the number of their satellite phone. At 2.05pm we called the Italian coast guard, who was already alerted to the distress of the travellers. When we spoke to the travellers at 4.42pm, they were panicking, and told us that their boat was losing air. At 6.35pm the travellers informed us that their phone was almost out of battery, and that they therefore could not call anymore. At 6.37pm The Italian coast guard confirmed that they would send two boats to intercept the travellers. At 9.35pm the Italian coast guard informed us that the travellers had been brought back to Libya. This case demonstrates a close cooperation between the Italian and Libyan coast guard in intercepting travellers, and thus preventing them from reaching safety in Europe (see: http://www.watchthemed.net/index.php/reports/view/954). On June 23, 2018, The Alarm Phone was alerted to a boat carrying an unknown number of people. The shift team was only able to maintain short initial contact, which broke down before getting useful information. The shift team was able to check and see that the Thuraya number had credit, and that it was unchanging. The Alarm Phone alerted MRCC Rome, which indicated they would not look into the case any further without more information. The number for the phone became unreachable. The boat was very likely intercepted by Libyan forces (see: http://www.watchthemed.net/index.php/reports/view/964). At 7.45am CET, The Alarm Phone received a call from a boat at sea asking to be rescued quickly. The boat had 20 women and 15 children on board. The shift team was in touch with MRCC Rome and asked for immediate assistance as the people were in distress. At 8.10, MRCC Rome confirmed they had informed the Libyan Coast Guard of the boat. The shift team maintained contact with the boat for several hours and attempted to support them through their stress, including by recharging their Thuraya phones. MRCC Rome and Malta refused to take responsibility, although GPS positions were provided. Rescue NGOs in the area were unable to find the boat in the area of the given GPS position, however, given that over 1000 people were intercepted by Libyan forces in that period, it is likely that this boat was also intercepted. MRCC Rome cooperated with Tripoli on many cases to intercept travelers (see: http://www.watchthemed.net/index.php/reports/view/965). On Saturday the 14th of July at 6.35pm, the Alarm Phone shift team was informed by a contact person about a group of 40 travellers who had left on a wooden boat from Libya. Eight women, including two pregnant women were part of the group. The travellers were in international waters and had reached the Maltese search and rescue zone. They had already been rescued the previous day by the supply vessel Sarost 5. MRCC Tunis as well as the crew of the supply vessel confirmed the position of the migrant boat in the Maltese SAR zone. Both Malta and Italy denied the supply vessel their permission to disembark the migrants in Maltese and Italian harbours. After rescue, they were provided with some food and brought to the oil platform. Later, the supply vessel took course on Sfax/Tunisia to disembark the people there. The authorities of Sfax, however, refused to allow them to disembark. They were then told to disembark in Zarzis/Tunisia. But since Monday the 16th of July, at 1am, they are also blocked from entering the port there. The travellers are still in limbo, stuck at sea, not allowed to disembark. The Alarm Phone is still following the case closely, demanding that the people are transferred and allowed to disembark in a safe port in Europe (see: http://www.watchthemed.net/reports/view/953). 16 18 boats have returned to Morocco by own forces, 1 boat was rescued by fishermen and 7 boats remained missing or their status unconfirmed. 23 Since 1993, the network UNITED for Intercultural Action has recorded the reported names, origins and causes of death for more than 34,000 travellers who have died whilst trying to get into Europe due to the restrictive policies of “Fortress Europe”. The List contains an impressive number of 56 pages of names. It can be downloaded here.